Being a progressive nervous system disorder, Parkinson’s disease impairs one’s movement severely. Symptoms set in gradually, sometimes with a barely noticeable tremor in just one hand. Tremors are a common symptom of Parkinson’s, but disorder can lead to stiffness and slowing of the movement. In the beginning phase of the disease, your face may show little or no expression. Your arms may not swing when you walk. Your speech may become soft or slurred. With time, the condition of your health deteriorates and symptoms start to worsen. Though Parkinson’s is progressive and worsens over time, it affects people differently. Two people affected with may have different symptoms. Not all people with Parkinson’s will experience all the symptoms. Symptoms may vary in severity between patients. The speed with which the disease worsens may also be different. However, physicians have established stages that elucidate how the disease progresses. These five stages are known as the Hoehn and Yahr Scale used by physicians across the world to classify patients. In this stage the symptoms of the disease appear in a milder form and only seen on one side of the body. It is called unilateral involvement. At this stage the functional impairment may be minimal or nil. As the symptoms of Parkinson’s are mild, the person affected may not seek medical attention and physician may be unable to come to a clear-cut diagnosis. Symptoms at this stage may include tremors, such as intermittent tremor of one hand, one leg may feel clumsy compared to the other or one side of the face may feel distorted, impacting the expression. It is very difficult to arrive at a diagnosis at this stage and the physician may wait to see if the symptoms worsen over time before coming to a formal diagnosis. Stage two is also considered early, but at this stage symptoms are characterized on both sides of the body. It is called bilateral involvement. At this stage, symptoms can affect the midline without impairment to balance. It may take months or years for symptoms to progress from stage one to two. Symptoms of Parkinson’s at this stage may include loss of facial expression on both sides of the body, soft voice, monotone voice, fading volume after starting to speak loudly, slurring speech, stiffness or rigidity of the muscles in the trunk that may result in neck or back pain, stooped posture, and general slowness in all activities of daily living. However, at this stage the affected person may still be able to do activities of daily living independently. The doctor can arrive at a diagnosis easily if the patient has tremor. But it should be noted that if stage one was missed and the only symptoms of stage two are slowness or lack of spontaneity of limbs, Parkinson’s may be misinterpreted as only advancing age. It is the mid-stage of Parkinson’s and the prominent symptoms are loss of balance and slowness of movement. Balance is compromised significantly by not being able to make the rapid, automatic and involuntary adjustments necessary to prevent falls. The affected person may fall frequently at this stage. All other symptoms of Parkinson’s may be evident at this stage and generally diagnosis can be made with much conviction at this stage. Often the doctor will examine impairments in reflexes at this stage by standing behind the patient and gently pulling the shoulders to know if the patient has trouble maintaining balance and falls backward (the doctor of course will not let the patient fall). An important aspect of stage three is the patient can still independently do their daily living activities, such as dressing, hygiene and eating. At this stage Parkinson’s has progressed to a severely disabling disease. 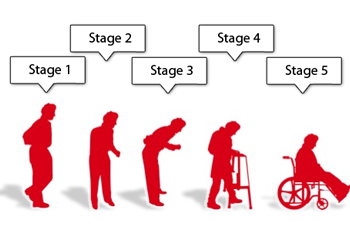 Patient with stage four may still be able to walk and stand unassisted, but they are visibly incapacitated. Many may seek the assistance of a walker to move around. Independent living is almost impossible at this stage and needs assistance with some activities of daily living. The necessity for help to live is the important feature of this stage. This is the most advanced stage and is characterized by an inability to rise from a chair or get out of bed without assistance. Patient is prone to fall while standing or turning. They may even freeze or stumble when walking. Round-the-clock care is needed at this stage to prevent falls and help the patient do daily activities. Hallucinations and delusions may also happen at this stage. Though symptoms worsen over time, it should be noted that some patients with Parkinson’s never reach stage five. Also, the time taken to progress from stage to stage varies from individual to individual. Moreover, not all symptoms of Parkinson’s may be evident in one individual. For example, one person may have tremor, but may be able to maintain balance. There are quality treatments available to handhold the patient through every stage of the disease. The earlier the diagnosis, and the earlier the stage at which the disease is diagnosed, the more effective the treatment is at alleviating symptoms.